Rockets barrage from Gaza continues Monday, as Qassam missile falls near Ashkelon. 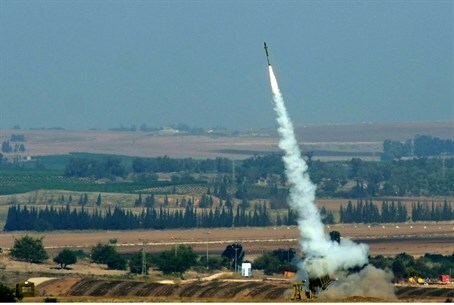 Terrorists fired a Qassam rocket from Gaza into Israel Monday afternoon, sparking the "red alert" alarm along the Ashkelon coast and surrounding communities. The rocket landed in an open field near the Ashkelon coast; no injuries or damage was reported. It came after a barrage of rockets hit the country over the past several days. Saturday night, a rocket fell in the northwestern area of the Negev. Last Thursday, Israel suffered from three attacks; a grad rocket was fired at the Eshkol Regional Council, terrorists fired a rocket at Ashkelon, and another rocket was fired at the Hof Ashkelon Regional Council. The IAF responded Sunday by wounding a senior Gaza terrorist, 29 year-old Abdulla Harti. Harti has been directly involved in the attacks. The rockets prompted a severe warning from Prime Minister Binyamin Netanyahu, who opened his weekly Cabinet meeting with choice words for Israel's enemies. "Our resolute policy against terrorism may be summed up in a single principle: Whoever attacks us or plans to attack us – will bear the consequences," he declared.